The festival of Makar Sankranti is a major harvest festival celebrated in Central India and on this day, Khichdi is eaten, given as charity and also as offering to Gods. Khichdi is a popular dish in India and has a variety of forms and styles of preparation but the things that always remain the same across all variations are the no-fuss, quick and easy preparation and the fact that it is filling and super healthy! 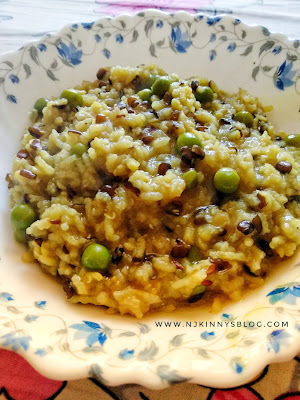 Today, I am sharing the recipe for Urad Dal and Matar Khichdi (Black Gram Lentil Khichdi with Peas) which is one of my favourites because it tasty, healthy, ideal recipe for weight watchers and very tasty. My mother always prepares this dish on Makar Sankranti. 1) It gives energy and acts as an energy booster. 2) It is good for the skin and improves the overall health and vitality of the skin. It is anti aging. 3) It is rich in protein. 4) It is good for the heart. 1) Heat Ghee in a cooker and add Hing. 2) Add Peas, Rice and Dal and stir for a minute. 3) Add all the spices and mix. 4) Add 4 cups of water and stir once. 5) Close the cooker and cook the khichdi till 4 whistles. 6) Serve hot and enjoy this filling, nutrient rich Urad Dal and Matar Khichdi! You can also accompany it with raita and papad or just eat it solo. It tastes yummy both ways.